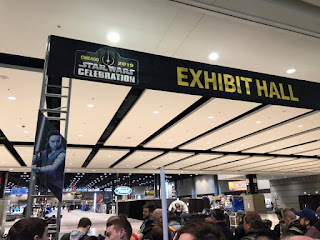 I attended Star Wars Celebration, a mega convention celebrating all things Star Wars, in Chicago. If you've read my Blurbs for a few years, you know that I published Star Wars Saturday articles in anticipation of The Force Awakens and The Last Jedi, ran a Star Wars Half-Marathon, and participated in a Star Wars seven movie marathon! I felt like this was a good chance for me to experience high crowds in a large city while attending an event that we all enjoy. Kind of sounds familiar, right? If I am going to still keep my goal of attending the 2020 Tokyo Olympics, I wanted a bit of a warm-up. So what things did I take away from my first major convention, and how do they connect to an Olympics experience? I have also been to Walt Disney World and Disneyland many times, and I have that planning down to a science. (Shamless plug to my former employer.) The planning involves finding a hotel, buying park tickets, booking plane flights, figuring out any sit-down meals, picking which park to attend on which day, scheduling FastPasses, and maybe even selecting the main attractions to see every day. 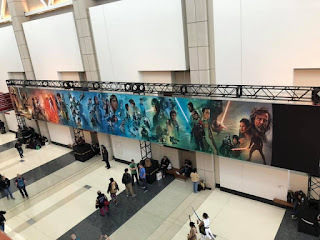 I felt incredibly unprepared for Star Wars Celebration because I'd never experienced it before. But now that I have a day under my belt, I would place the planning squarely in the middle of the two. I didn't have to get a hotel this time because I just commuted, but I did need to figure out parking. I brought my own food so I wouldn't have to buy overpriced food. I made my own spreadsheet of the schedule because I couldn't find one online. (But there was one on the pamphlets they handed out at the entrance! Why couldn't they have published that online?!) And I entered the lottery to get into some of the major panels! Olympic Connection: There is no possible way to attend the Olympics without any planning. If anything, you need to buy a plane ticket! So if you plan on attending, then be sure to gather where you're staying, where you might want to eat, what events to attend, and what to do on the days when you won't be seeing events. Get ready for people. Lots of people. 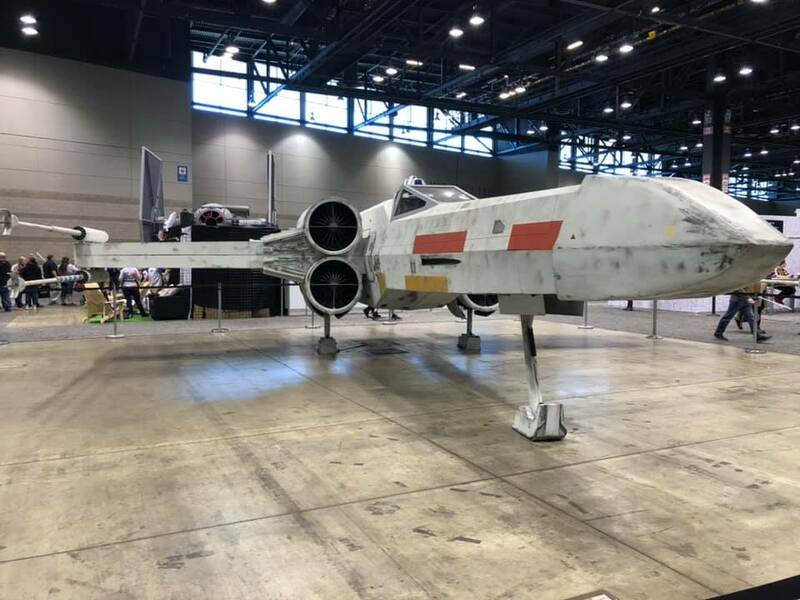 While Star Wars Celebration does have quiet spots (and even a dedicated Quiet Room if people need it), there is just a lot of people. Going into some parts of the Exhibit Hall require squeezing into tiny hallways with people on every side. (And most carrying backpacks, like me. Sorry!) 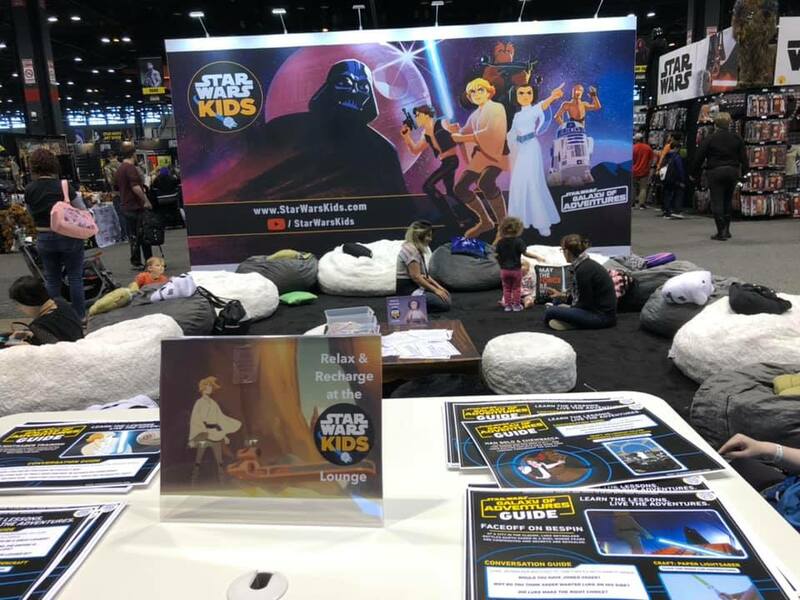 But the major bonus is that everyone who is at Celebration all share one major passion: Star Wars. While people may enjoy different parts of that livelihood, it's all under one amazing umbrella. Olympic Connection: Not only is everyone a sports fan at the Olympics, there are people from all over the world who are sports fans! If you want to have a worldly experience, the Olympic Games is the place to be. But remember that everyone has different cultures and different ways to do things, so it's important to be respectful of that. Just enjoy the fact that you're all together to experience something amazing! Don't be disappointed when things don't go as planned. While planning was important, I did have to have backup plans. I didn't get into a room to see the Episode IX panel like I wanted, so I sat in a hallway, ate my lunch, and watched it on my phone with my headphones. I wanted to get into two panels - a trivia match and a Lucasfilm Publishing panel - and both were full by the time I got there. 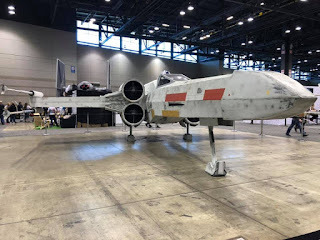 So I checked out some other areas of the Exhibit Hall and watched the Star Wars Show do its live broadcast. Actually, because I missed the Lucasfilm Publishing panel, I got to see Kelly Marie Tran, JJ Abrams, and Anthony Daniels get interviewed! Olympic Connection: Weather will probably be the greatest enemy to Olympic fans. While planning is great, understand that not all the plans will happen. Don't be specific with your plans. If you go into something saying, "I must see Simone Biles do a perfect vault!" then you might be disappointed. But if your plan is to attend a basketball match, then the goal is much more achievable. And never be afraid to improvise, because some of the most amazing things might happen! Lines are everywhere. Just be okay with it. I always make it a priority at Walt Disney World and Disneyland to never stand in a line if I don't have to. 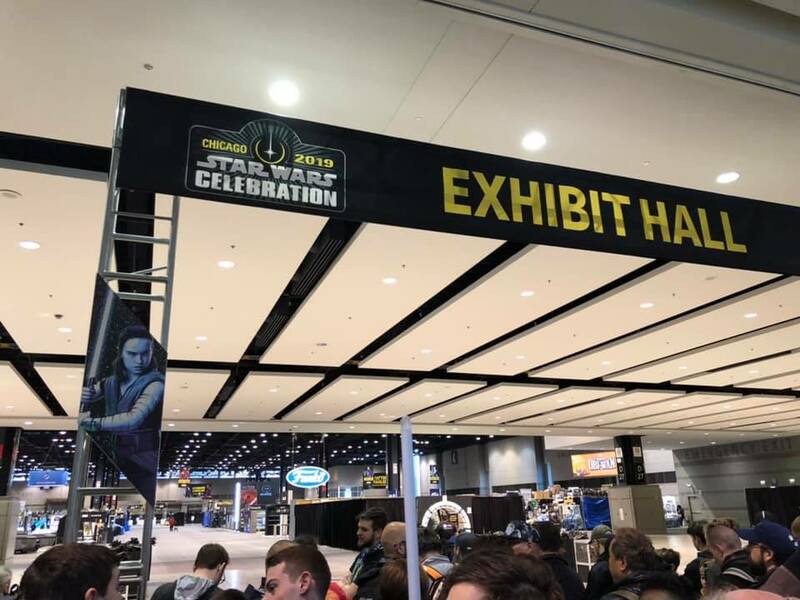 But at Star Wars Celebration, I have to. If I don't, I won't get any photo-ops, I won't get into any panels, and I'll just leave disappointed and bitter. So I sat (literally sat!) in a line for two hours to get into the Exhibit Hall right when it opened. So I sat in one long queue to get into panels for the music of The Phantom Menace and another shorter queue to see journalists talk about how they cover Star Wars. 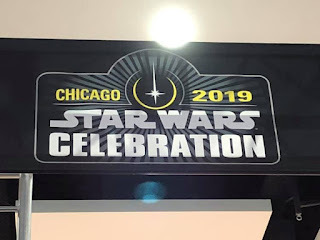 I stood in line to go through bag check several times between McCormick Place (where most of the convention was) and Wintrust Arena across the street (where the biggest stage - Celebration Stage - was). There's always a goal to be in the shortest line, but it will still be a line! Olympic Connection: You think there won't be any lines at the Olympics? Ha! How many times will you have to go through a security checkpoint? How many lines will you wait in to get to an event? How long will the bathroom lines be? What about food? Learn patience. Figure out how to meditate in line - and yes, I did do a bit of mediation while I was in line! Did I mention learn patience? Don't forget to hydrate and eat. It was very, very easy for me to forget to eat and drink as I was constantly walking around and being distracted by the things around me. But I listened to a lot of bloggers, vloggers, and podcasters who reminded me before I left my apartment to pack food! I took Pringles, Reese's eggs, granola bars, fruit bars, and sandwich wraps with me. But even then, I would forget that the food was in there! (To paraphrase the musical Annie, "Lucky you got them lines!" Olympic Connection: It's going to be hot in Tokyo. I really hope they've thought ahead and made it possible for there to be free water stations around the outdoor event areas. But eating and staying hydrated is all on you. Drink lots and lots and lots and lots of water. Don't be tempted to purchase the food in the arena when it might be expensive and not very good. If Japan is good for anything, it is good with convenience stores. 7-11 is huge there, and is light years beyond the 7-11s you're used to in America! Food is cheap, and usually delicious. If you just need a snack, that is much better to do. It is easy to let the planning, goal-getting, and occasional frustration overtake us. But remember that there are millions of people all over the world who desperately want to be where you are, and you get to be there! 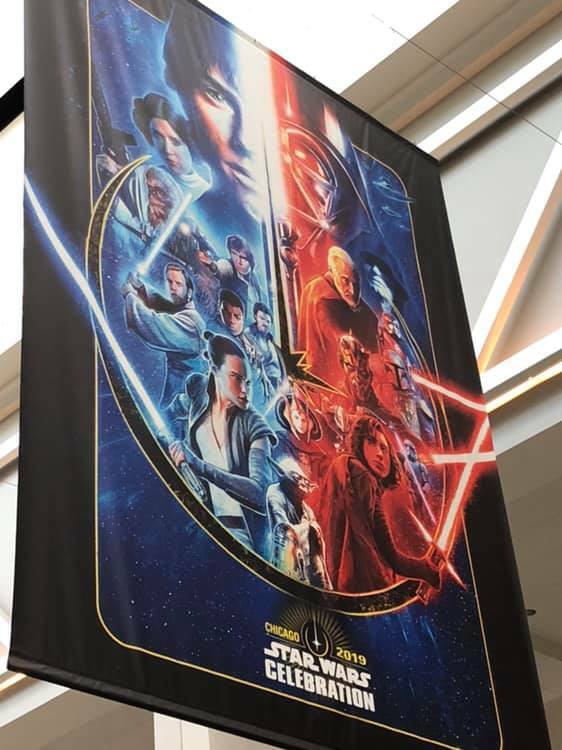 That hit me the most as I gazed upon an amazing piece of artwork made specifically for Star Wars Celebration. That hit me when I passed someone cosplaying as the mountainous island on the planet of Ach-To (complete with animatronic porgs) and all the other amazing cosplayers around me. 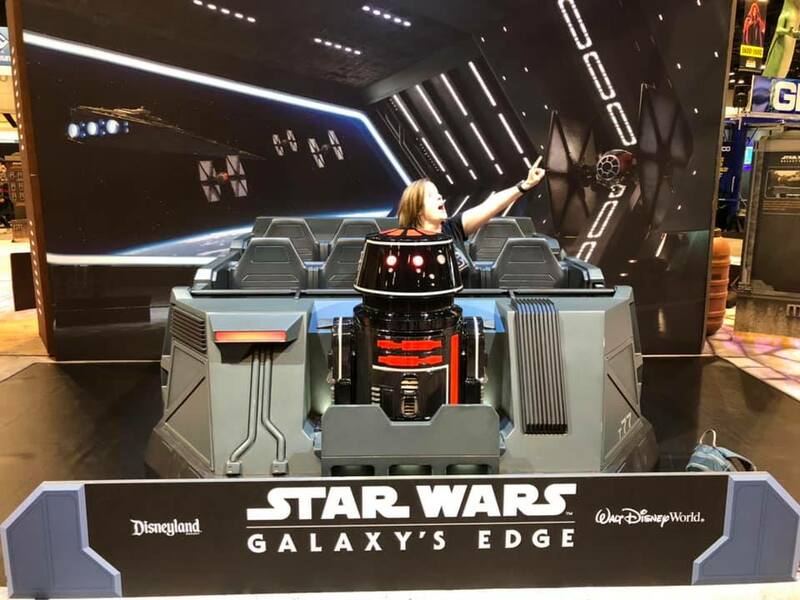 That hit me when I stood on the Star Wars Show Live stage, saw famous people on the screen, and saw myself in the background! (It would take a bit to see me, but I knew where to look!) I have watched this live-streamed for so many Star Wars Celebrations, and was so determined to see it in person. And now I was! Live in the moment! Olympic Connection: Do I have to say it? Live in the moment! You are watching people win freakin' gold medals! The real deal! You're gazing at the Olympic flame! You're seeing famous athletes from all over the world! It is, for some people, a once-in-a-lifetime opportunity, and millions of people on this earth will never experience it. Enjoy this wondrous experience. 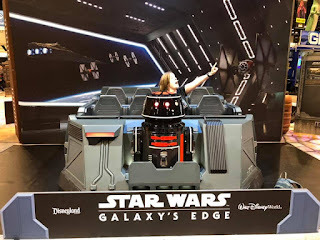 So thank you so much for letting me relate my amazing weekend experience at Star Wars Celebration and find a loose way to connect it to my Olympics blog. All of my points work for many experiences, so make sure to use them!